An automated external defibrillator (AED) is a portable device that delivers an electric shock to the heart. The shock can stop an irregular rhythm commonly known as fibrillation and allow a normal rhythm to resume in a sudden cardiac arrest patient. Sudden cardiac arrest is an abrupt loss of heart function. If it’s not treated within minutes, it quickly leads to death. must be “defibrillated” quickly, because a victim’s chance of surviving drops by 7 to 10 percent for every minute a normal heartbeat isn’t restored. A built-in computer checks a victim’s heart rhythm through adhesive electrodes. The computer calculates whether defibrillation is needed. If it is, a recorded voice tells the rescuer to press the shock button on the AED. This shock momentarily stuns the heart and stops all activity. It gives the heart the chance to resume beating effectively. Instructions guide the user through the process. AEDs advise a shock only for ventricular fibrillation or another life-threatening condition called pulseless ventricular tachycardia. Non-medical personnel such as police, fire service personnel, flight attendants, security guards and other lay rescuers who have been properly trained can use AEDs. 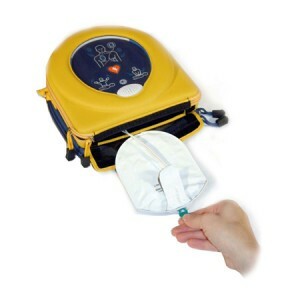 Are AEDs safe to use? AEDs are safe to use by anyone who’s been trained to operate them. Studies have shown that 90 percent of the time AEDs are able to detect a rhythm that should be defibrillated. And 95 percent of the time they are able to recommend NOT shocking when the computer shows defibrillation is not indicated. AEDs should be placed in public areas such as medical offices, warehouses, office complexes, sports arenas, gated communities, airports, and any other public or private place where large numbers of people gather or where people at high risk for heart attacks live. 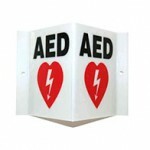 Please submit our AED Training Request form and we can provide you with a free no obligation quote today.